Wargaming with Prince August 40mm semi-flat figures. I decided to make some light troops for a project I am planning. Hopefully PA will bring out some dedicated moulds in the near future, however in the meantime I had a play with what I currently have available. The tricorns for the officers and drummer are from the Prussian guard infantry (rank ans file), I chose this as it has the scalloped edge - I cut the mustache off using a sharp knife. The NCO has a musket from the Russian officer. I appreciate the lace is all wrong, however they do what I always wanted from this range - look the part even if not 100% correct. The figures are singly based as I am planning to use thenm with the recently published 'A Gentleman's War' rules. 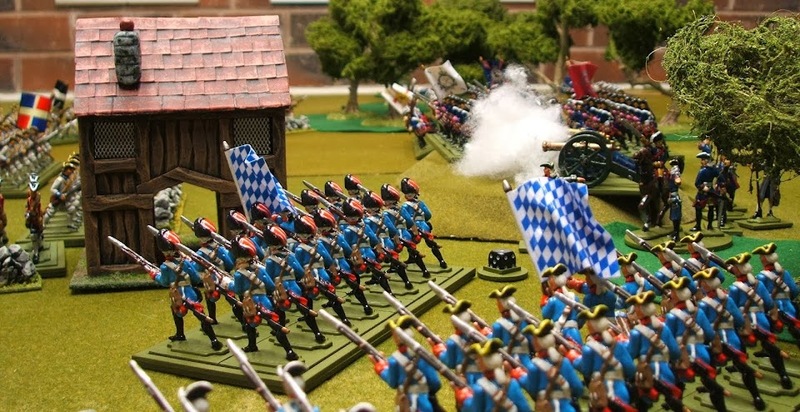 Next up some Austrian Light troops. I fancy painting up 'Grun Loudon'............what figures to use??? I have finally made a start to painting some more Prussian infantry - this time IR No7 - Braunschweig-Bevern. These are pretty much the standard Prussian castings, with the exception of the officer who is a Russian with a Prussian head. He needs a little conversion - just remove the belly pouch and shave off the buttons from the front of the coat. I really do not enjoy painting Prussians - I find working with the dark blue difficult. The flag is from Maverick Models - 80p well spent! Work on the dragoons is moving on slowly, the current plan is to revert back to figures with the horse and torso together, as it proved difficult to produce an accurate fit on the torso to horse connection (hands-up that was my idea) . It is still proposed to keep separate arms and heads to allow more variety. 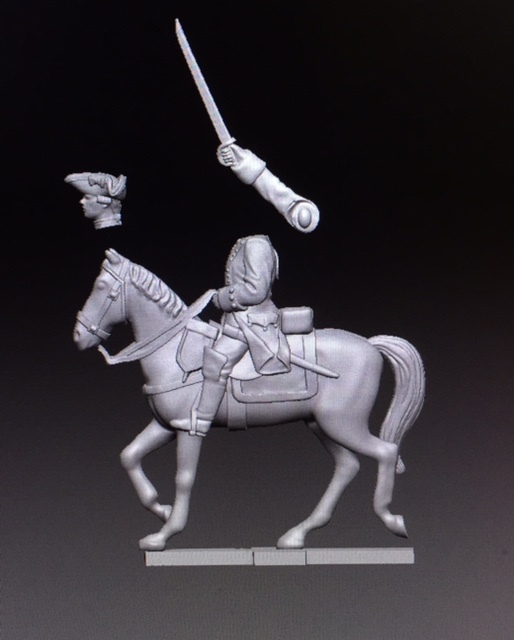 Both the horses and riders will be about 7% smaller than the cuirassiers to rescale the horse to 15 hands compared with the 16 hands for the cuirassiers. 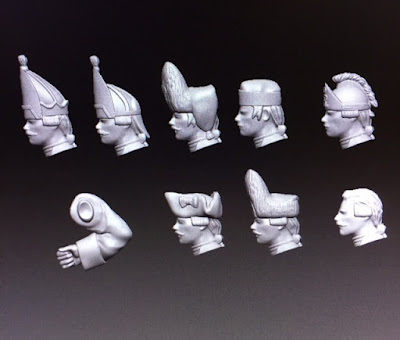 There will be 3 figure moulds, an officer (pictured below), a drummer and a trooper, along with an extra arm to convert either the officer or trooper into a standard bearer, these will have 'Austrian' heads, which are also suitable for French, Russians and quite a few others. Below is the work in progress for the heads - these need a bit more work but give an idea of what is proposed. As always feedback would be appreciated.